The Chevrolet Impala was rejuvenated again for 1961, officially the year when the third generation rolled into production. Chevy’s flagship full-size model was now entirely modern and, more importantly, an SS version became available. The Impala debuted in 1958 as the top trim level for the Bel Air known as the Bel Air Impala. 1958 was the year of GM’s 50th anniversary, and the Bel Air Impala was the anniversary Chevrolet model. It featured different styling compared to lesser Bel Airs and people bought into it. So much so that, only one year later, the Impala became a model of its own - which is now considered the second generation Impala. 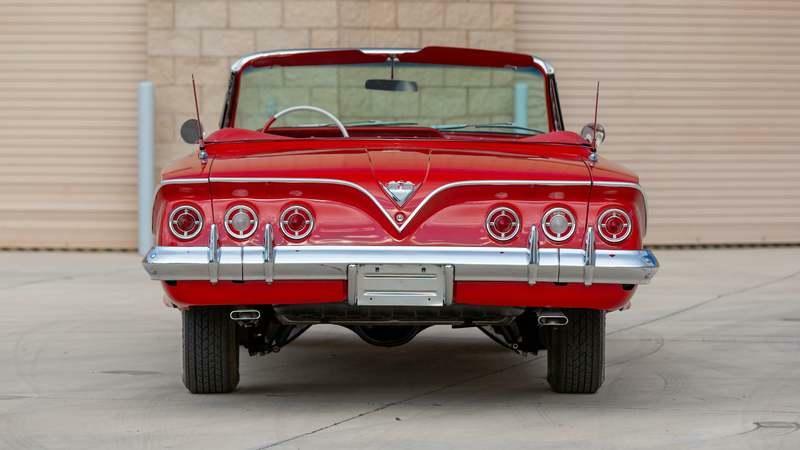 The 1961 Impala was still based on the B-body platform and sat on an X-frame chassis without side rails that were said to improve rigidity and lower the center of gravity. It had already been in use for two years on the previous Impala iteration. The new car came as a Hardtop 2-door Coupe, a Convertible, a 2-door Sedan, a 4-door Sedan, and a 4-door Station Wagon. The 1961 Impala was a major departure, from the previous generation design-wise. For one, the teardrop taillights that sat on either side of the V-shaped rear end were gone and the traditional setup of six taillights, three on either side, returned. What is more, the car now had a more compact look with a much shorter front overhang. Also, in tune with the times, the tail fins were gone although they were mimicked by a design line that went up and around the back creating a ridge that formed a V shape in the middle of the rear panel. This model really put the Impala on the map as an incredibly popular model and, by 1965, when the fourth generation was launched, the Impala sold 1,000,000 units in one year. 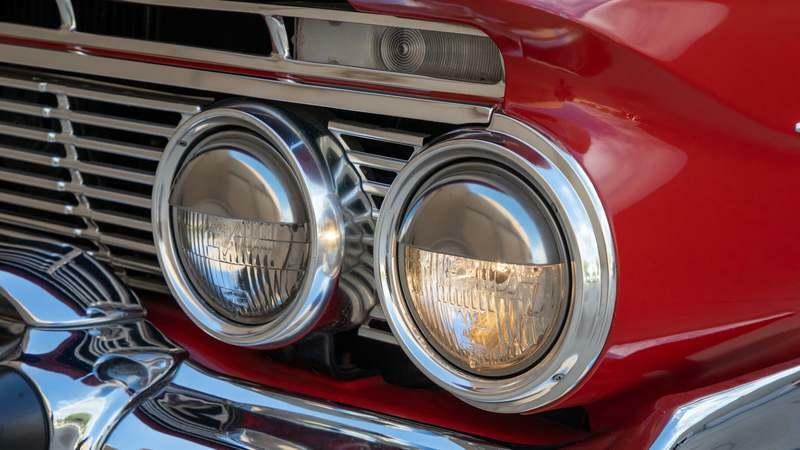 Up front, Chevrolet designers kept the eyebrow-like line that swoops up around the corners of the front end to essentially ’open up’ the front fascia. 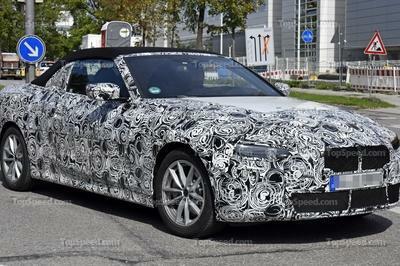 The car is fitted with a full-size grille that covers the whole width of the car with crisscrossed bars. The headlights are fitted on the grille, two on each side. They have chrome frames and a mirror-like headlight cover that looks like an eyelid. 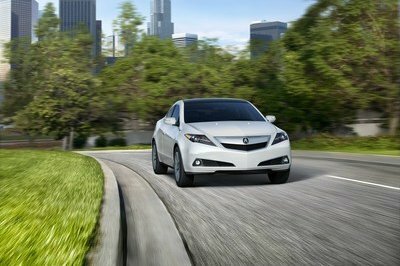 The outer headlight goes beyond the edges of the front grille, curving outwards. The indicators sit above the headlights guarding a set of six rectangular air inlets of equal length. The Impala sports the crossed-flag badge on the nose, not the usual Chevrolet logo. The front bumper, which curves around the front corners, comes with an extra handle-bar bumper to which the rubbered shock absorbers are fitted. The Chevrolet name is spelled letter by letter on the car’s hood. The hood has a number of creases, especially a more evident one on the middle. The exterior rearview mirrors are placed on the fenders on this convertible model. For styling purposes alone there are two chromed elements on the fenders which are shaped similar to a plane’s vertical stabilizer - remnants of the space age, maybe? While still a big car, the 1961 Impala was actually 1.5 inches shorter than the 1960 model although it had the same 119-inch wheelbase. Viewed from the side, the third generation Impala looks tamer compared to the older iterations. The side insert that gets wider towards the back is still there. To match with the two-tone interior, the insert is painted white. The car has a main character line that crosses just above the chrome door handles and then there’s another one formed by the lower line of the side insert which goes down as the insert widens, only to swarm up at the back. You’ll notice the redesigned windshield of the 1961 Impala which is no longer fully wrapped around the car’s corners as there is now a small window that fits within the otherwise narrow windshield frame on both sides. To add to the car's stylish look, the Impala came with rear wheel covers and a chromed piece on the rocker panel. This particular Impala comes with two antennas. The Impala we see here, which will be up for grabs at the November 15th-17th Mecum auction in Las Vegas, Nevada, has chromed hubcaps with a chromed knock-offs. The rim itself is painted in the color of the bodywork and the BF Goodrich tires are complete with a narrow white line - one of a few of SS elements that can be found on this non-SS Impala. The rear end offers the classic look of the six round, pointy, taillights, each with one reversing light in the middle. The choice to revert to this three-piece design was made so that the Impala could be easily distinguishable in a fleet of Biscaynes and regular Bel Airs which only had four taillights. As I said, the rear line of the side insert goes back up and forms a thick ridge which travels across the back fascia. It sharply plummets down and jumps up again in the middle of the panel to form the characteristic V. This was previously outlined by the angled trunk itself. The back bumper is equipped with a couple of sharp over-riders on both sides which go just between the taillights. The trunk opens up with the center panel and the four inner taillights. The other two are planted in the fender. This particular Impala has two exhaust pipes sticking out the back. 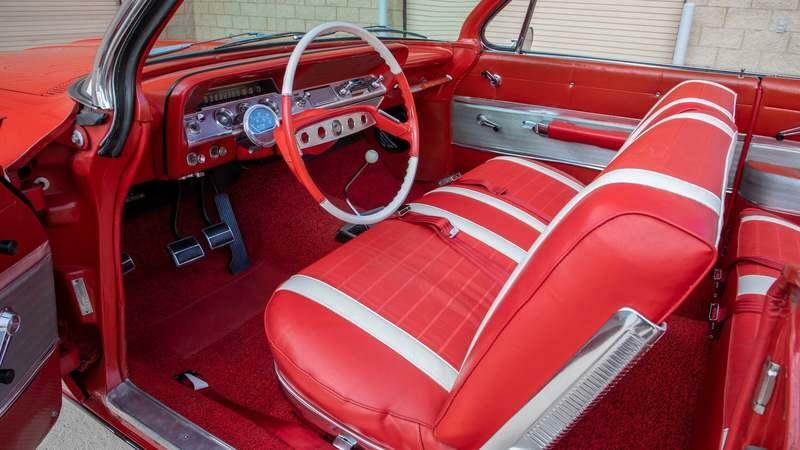 The third generation Impala was still classified as a full-size sedan which means it was big enough to fit six adults, three on each of the two bench seats. 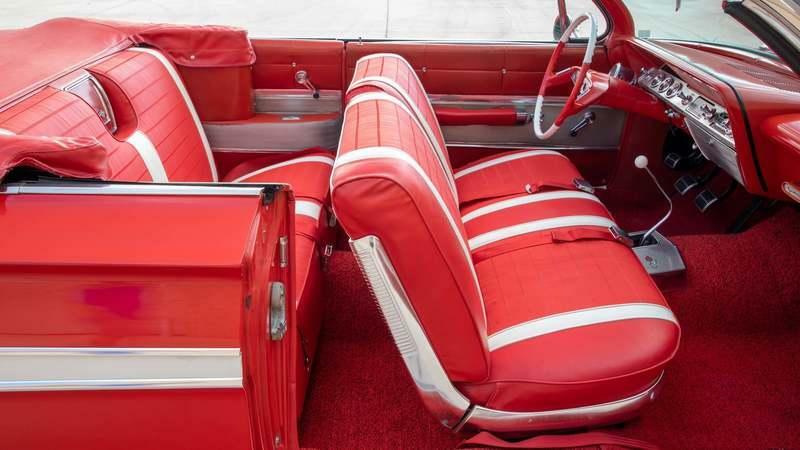 The interior was usually two-tone with the example in the picture sporting a white-red combo. The seats, dashboard and the door panels are all covered in leather with some quality metal trims here and there. If you seat in an Impala, you’ll have to make use of that flimsy two-tone steering wheel with a drilled central element which seats in front of a huge tachometer mounted on the steering column. Behind it, on the shiny metal center-piece, there is the odometer, the oil meter, and the water and fuel meter. The speed is being shown on a horizontal clock. There are also many buttons, switches, and knobs on the dash including the controls for the optional AM/FM radio cassette player. This car also has a power-operated white convertible top. The steering is extra light thanks to power assistance. The instrument cluster extends toward the passenger side. All of the gauges and knobs are placed in a recessed area of the dash, clearly outlined by the protruding outer edges that extend beyond the edge of the glovebox. There’s also a handle on the right-hand side to help you get in and out of the car. Metal inserts also come on the door panels, as well as on the side panels behind the front seats. The gear lever sticks right out of the floor and ends with a white knob. The lavish back seat features a mid-mounted plaque where the crossed-flag logo is placed. Another such logo can be found next to the stick shifter on the polished metal plate. A number of four engines were available for the 1961 Impala with the power output varying for a couple of them in accordance with the preferred carburetor setup. The base engine was the 3.9-liter inline-6 ’Blue-Flame’ engine with hydraulic valve lifters capable of 135 horsepower. 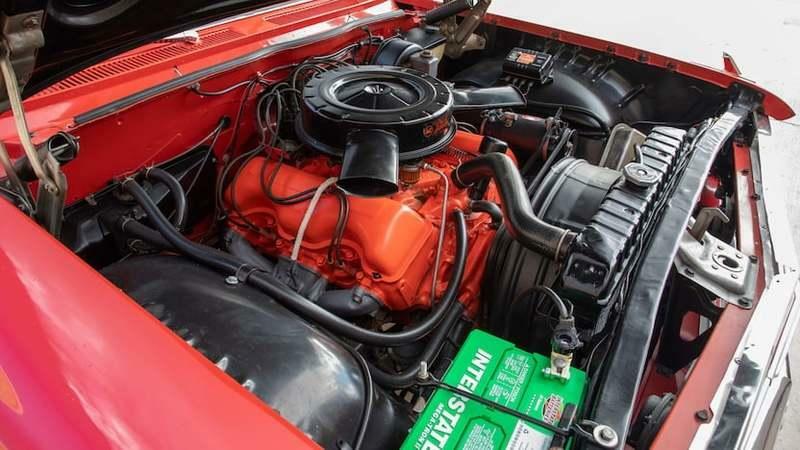 Then there was the 4.6-liter V-8 engine which was available with either a two-barrel carburetor, making 170 horsepower, or with a four-barrel carburetor which ramped up to the power output to 230 horsepower. Finally, there was the 5.7-liter V-8 which put out between 250 and 330 horsepower depending on the type of carburetion and compression ratio. Finally, in mid-1961, the SS package became available for the modern equivalent of $484. It featured a stiffer chassis, some exterior trim elements and the massive 409 6.7-liter V-8 with increased bore and stroke that deployed 360 horsepower and 409 pound-feet of torque. It had a compression ratio of 11.25:1 and was fed via a quad-barrel carburetor. The basic 5.7-liter W-series Turbo Thrust V-8 developed 250 horsepower at 4,400 rpm and came with a Rochester two-barrel carburetor. Torque was advertised at 355 pound-feet at 2,800 rpm with a 9.5:1 compression ratio. Most third generation Impalas came with the 3-speed manual transmission, available with overdrive, or the 2-speed Powerglide automatic. However, there was also a 4-speed Turboglide manual and that’s the transmission fitted to this red Impala. All of the manual units were synchromesh. Suspension was by coilovers on all four corners as it had been on B-body ladder-type cars since 1958. An entry-level Impala with the inline-6 ’Blue-Flame’ engine installed set you back roughly $3,445 57 years ago. In today’s money, that’s $28,500. However, a V-8 would boost the price to about $4,000 or $33,000 today. 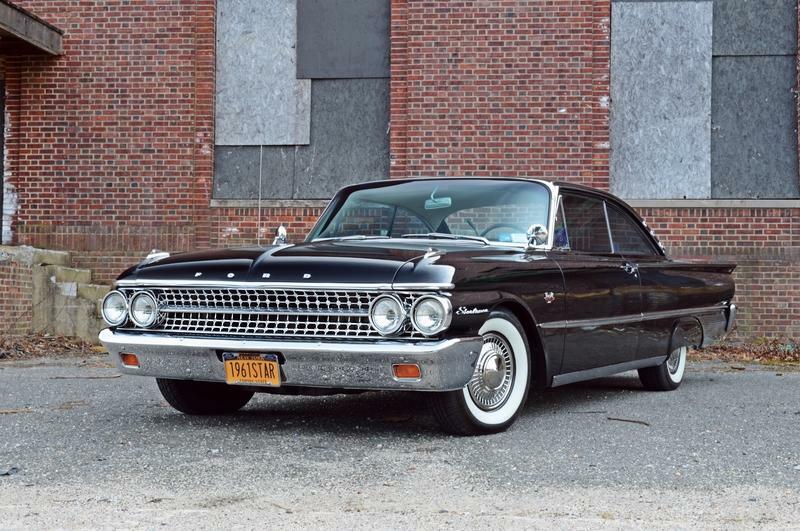 Nowadays, you can find a beater 1961 Impala for as little as $8,000-10,000. After all, over 490,000 units were made of all body styles that year. However, the convertibles only amount to about 100,000, and only 443 of all the 490,000 cars made were fitted with the SS package. That’s why the price can go up and up according to the quality of the restoration and the engine that’s under the hood. A V-8-powered non-SS Impala can sell for somewhere around $20,000-$25,000, but a genuine SS is much more expensive. Also, the two-door sedan variation - not the 2-door coupe with the popular bubble top - is quite rare in its own right, so prices for that one are on the rise too. 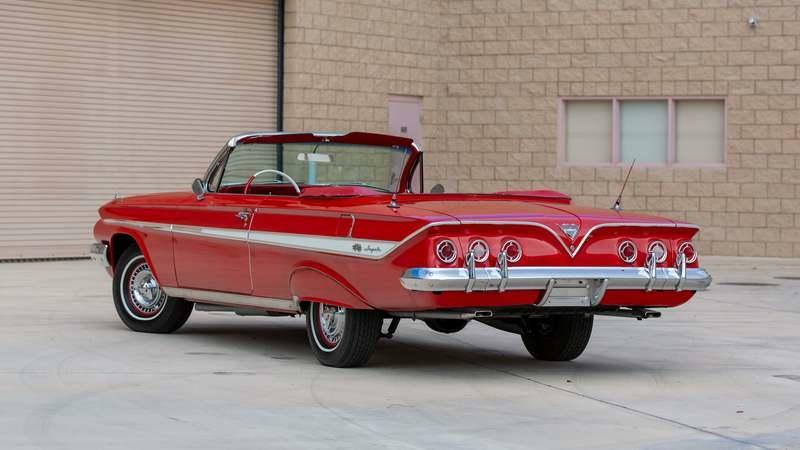 The Galaxie was originally launched in 1959 and then abruptly redesigned for 1960 with a body that matched the smoother, less flashy, design cues that took over at the dawn of the exuberant ’50s. Then, in 1961, the Galaxie was restyled again. 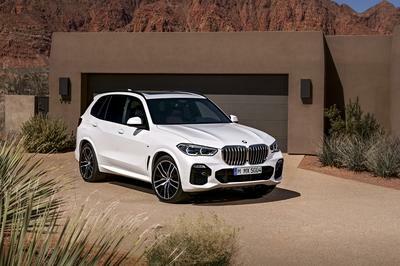 It retained its four-headlight setup up front but the grille was changed, now heaving a chromed bar in the middle and being tilted towards the inside. At the back, the fins were minimalistic, stretching out only slightly beyond the body’s extremities. The car had two round ’pie-plate’ taillights like the Falcon’s but there was a grille in between them. It had the same wheelbase as an Impala. The car was offered with the 6.4-liter FE series pushrod V-8 with either a four-barrel carburetor or three two-barrel carburetors. The latter unit was rated at 401 horsepower. 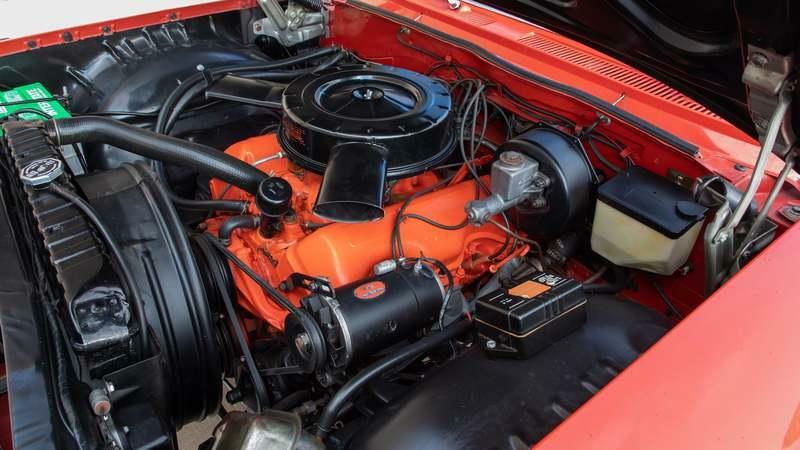 If performance wasn’t necessarily what you were after, you could also have your Galaxie equipped with the single two-barrel carburetor 5.7-liter V-8, the 4.8-liter Y-block V-8 or the 4.7-liter Windsor V-8. 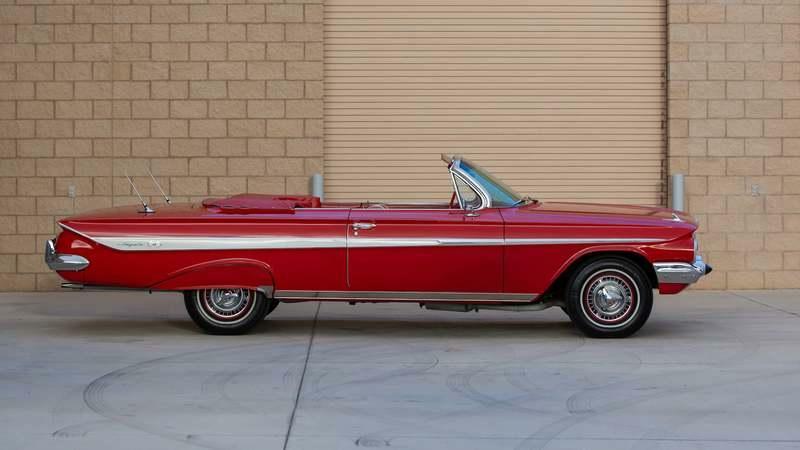 The Galaxie Starliner, which was the named given to the convertible Galaxie, came with power steering and power seats as well as a full leather interior. It was marketed as a luxury convertible model but it didn’t appeal particularly much to customers and it was dropped at the end of the year. 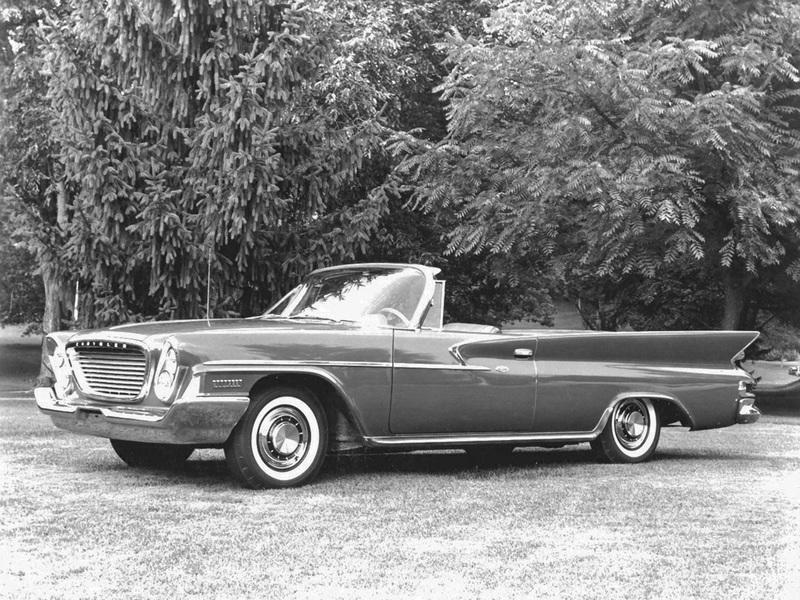 The Newport moniker was revived for a third time by Chrysler for the 1961 model year, the first for what would become a mainstay model in Chrysler’s lineup up until the early ’80s. The Newport was offered as a full-size sedan and station wagon, but a two-door coupe and a two-door convertible body style were also on sale as early as 1961. 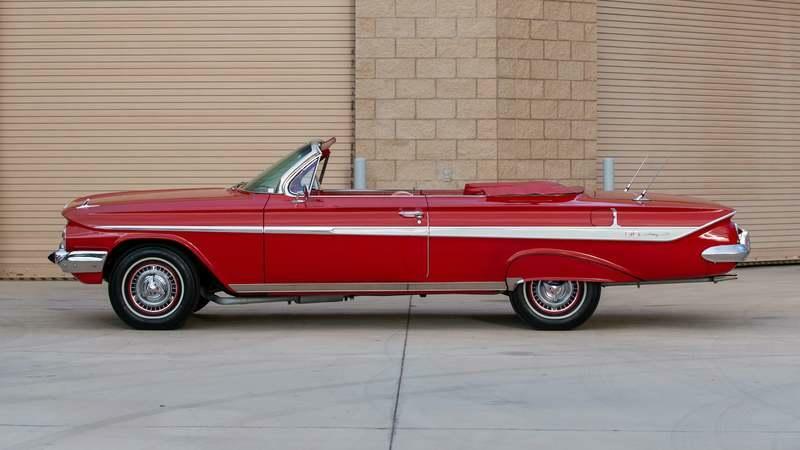 The 2-door convertible model wasn’t by any means a best-seller, only 2,135 examples being sold in 1961 at a price of $3,445 or about $29,000 today. It featured a horizontal mouth framed by the two headlights which were positioned at an angle. It was about as big as the 1960 Chrysler Windsor which shared a similar design. Just like the Bel Air, the 1961 Newport lost the fins that were once a poignant styling element on any Chrysler model. Most Newports came equipped with the 6.3-liter V-8 which put out 305 horsepower. However, the car, marketed by Chrysler as an entry-level model compared to the lush New Yorker and 300, was also available with the 5.9-liter V-8 good enough for 265 horsepower. 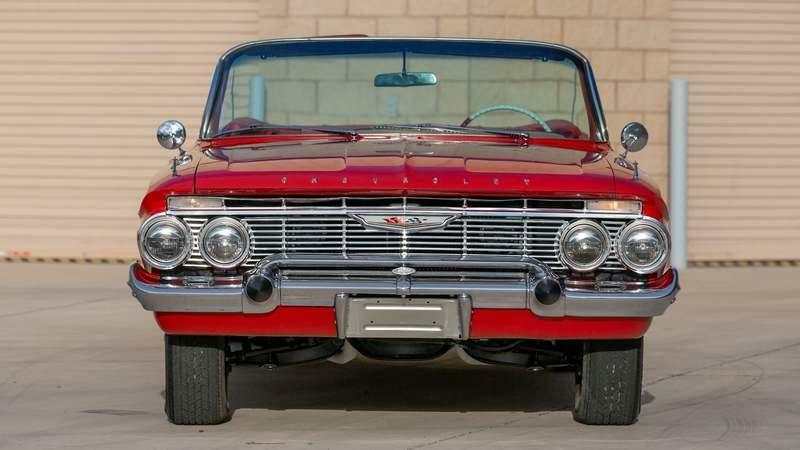 While the Newport was the cheapest model in Chrysler’s range back in 1961, accounting for most of the manufacturer’s sales that year, it’s still almost as stylish as the up-market models made by Chrysler at the time. 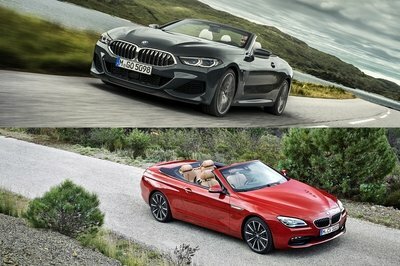 You can find a coupe or a convertible for anywhere between $10,000 and $25,000. The 1961 Chevrolet Impala was the first Impala that really caught on. In the following years, the car became a real hit and its popularity has endured for decades. I mean, just think of how many lowriders have been built in the past 30-odd years with an Impala as the base. 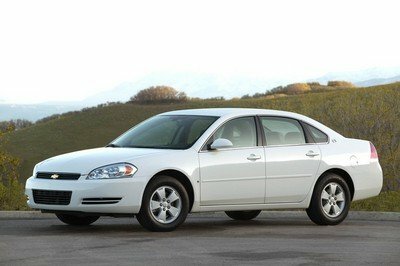 The Impala was also the Chevrolet’s first attempt to dip its fingers into a more sports-oriented persona with the upmarket Impala via the SS model. It had a big engine and 360 horsepower - a figure that couldn’t even be matched by the choked muscle cars that would come along only a decade later. But, beyond all of that, the 1961 Impala is simply a classic-looking legendary Chevrolet model that deserves all the credit it has been getting over the years. 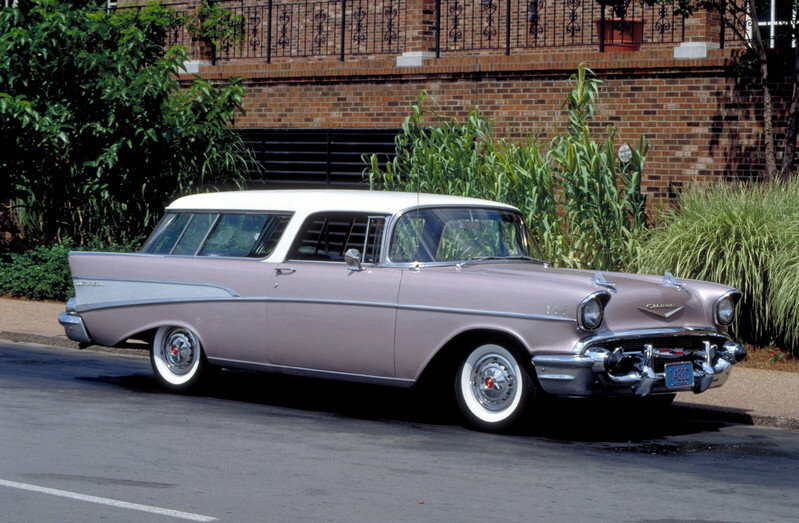 Read our full review on the 1957 Chevrolet Bel Air. 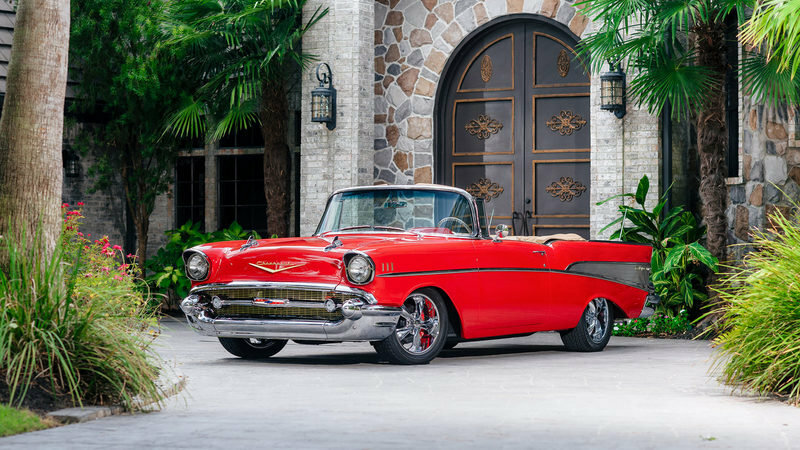 Read our full review on the 1957 Chevrolet Bel Air Convertible. 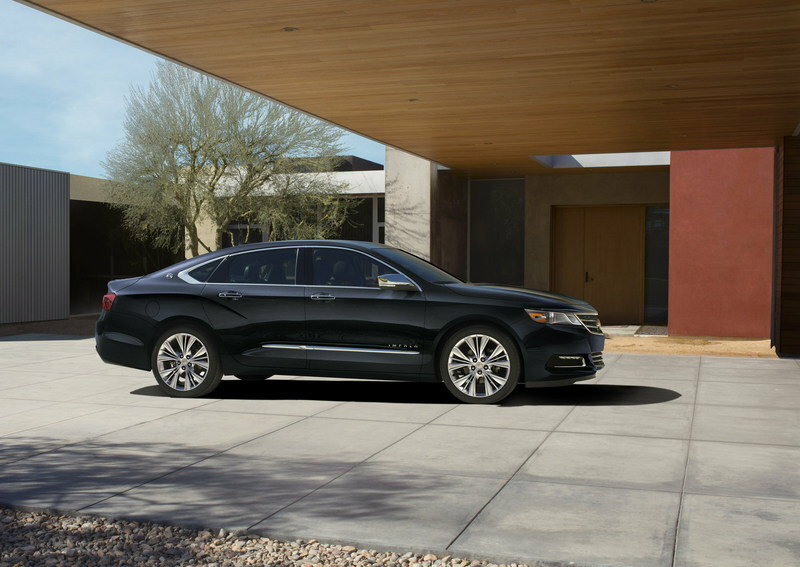 Read our full review on the 2015 Chevrolet Impala.